It was up to me to work out what Geoff and I were going to do with ourselves this afternoon/evening. I didn’t really succeed in any grand plan (much to my dismay more than Geoff’s) but in the end it didn’t really matter. We opted for a ‘picnic’ (Unprepared style = buy pizza rolls, chocolate and coke from the nearest supermarket. Mmm healthy!). I decided that I’d drive, considering I hadn’t hardly worked anything out, clearly I’d be a flagellant if I lived in the Middle Ages. So we are driving up to Warburton and decided to go the extra mile to the top of Mt. Donabuang. We were so close and then Fred (my car) let out an angry hiss and Geoff made me pull over very, very quickly. The hiss was promptly followed by a lot of steam and the splattering spray of some nasty brown/oil smelling liquid. 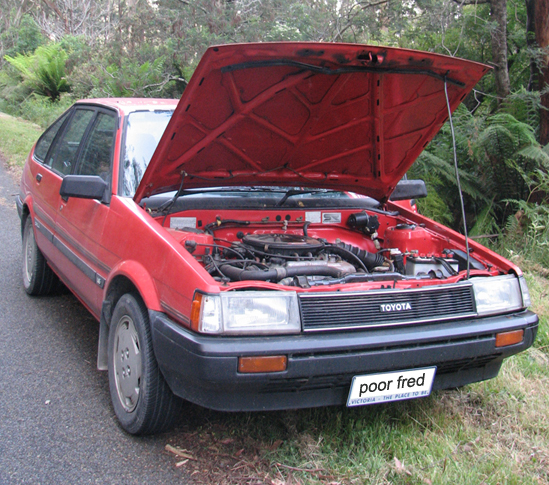 The diagnosed hypothesis was that I’d blown a hose, it looked like there was an abundance of oil so we decided not to ineptly perform home mechanics and instead went to call the RACV. Of course there was zero phone reception. Nice motorbike man saved the day, and drove my details to an area with reception and called the RACV for us. We had an hour or so to kill in which we ate our picnic in the car and had plenty of humorous conversation matter (laced with intervals of verbal annoyance that my stupid car had decided to carked it). I also got a photo or two but don’t have it just yet. The RACV guy was a tad cranky because he got a little lost on the way to find us. He thought I might’ve at first have blown a head gasket and then changed his mind after pouring a lot of water in some hole (believe me I’m not a mechanic) much to my relief. So my car was simply overheated and had a massively dirty radiator – hence the brownish liquid. He of the qualified followed us back down the mountain and I watched the guage very closely as we drove back to Geoff’s. We ended up playing a highly competitive game of RISK with Ron and Anne (Geoff’s parents) where I was the first to go out and it came to a one on one, piece on piece roll of the dice. Geoff conquered. Here’s to my car for sharing my 1986 status, because I actually had an exceptional evening! Whenever something like that happens to me.. I like to laugh and say “Ah well, it’s something to tell the grandchildren!”. I then keep the memory in hopes of re-telling it to my future grandchildren, and boring them to death. conquered? what about a full and frank admission?